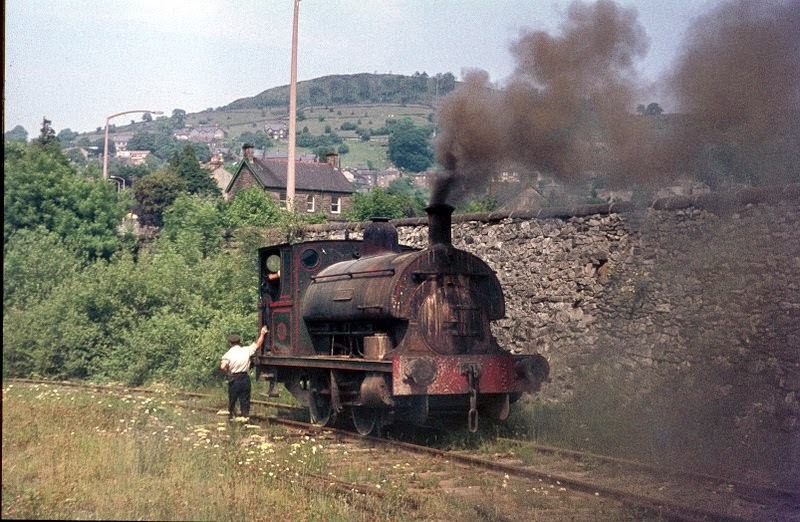 A very lovely hot summer day saw us pottering up and down the valley with our passengers and generally making an enjoyable and leisurely performance out of running a railway. 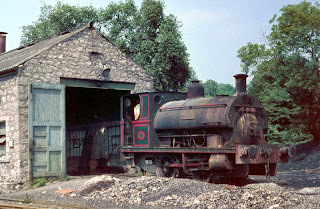 Down the yard, the marathon paint job that is the LMS brake van continued, and fairly nearby the boiler of austerity locomotive The Duke was also receiving paint. the routine maintenance of the class 31.
during the passage of trains in order to prevent ladies fainting. Saturday saw Derbyshires friendly railway basking in sunshine which brought out the visitors to our railway. Iris was used on the incline as the 122 bubble car worked the main line between Wirksworth and Duffield. The Booking offices, evra shop , model railway and the Pullman buffet looked after the needs of our visitors. The duty conscript found himself cleaning and painting the crossing gates with primer. 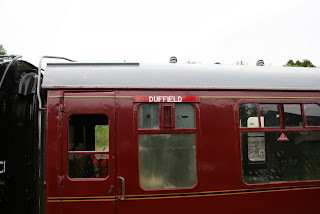 The Dmu team completed more essential work in the guards compartment of the 119 railcar. Rob , Graham and Jack looked after the repairs and refueling of the 3 car set. Oakes enterprises were to be found dismantling the dukes bunker. 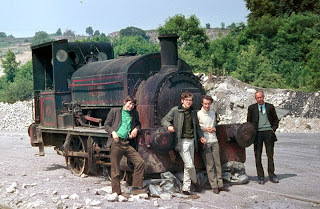 The 8f group where busy dismantling the faulty bearing on Henry Ellison. The Lmsca where busy sanding the sides of the third open in the shed. 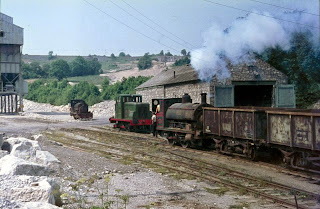 a pts and introduction to shunting course were also held at Wirksworth. Many thanks to all who participated in making it such an enjoyable day. A quiet and rather damp day, but we pottered around with a number of Steam Experience guests. Work proceeded in the shed on the Third Open and with a number of repairs and renewals in the Picnic Area. Please note that the Ladies floor has been painted and whilst it is drying ladies should be advised to stand on one foot only. Life is never as expected with today's excitement being the closure of our footbridge (F1) on the approach to Duffield by the County Council on the basis that it was unsafe due to the condition of the timbers. Timber has been sourced and delivery is promised for 8th July with a view to renewing on 10/11 July at a cost, of course! However, today saw a most pleasant charter from Duffield to Wirksworth and return looked after by Pat, Peter, Ollie and Richard. Our work experience guest, Joe Marsden, was pressed into service to assist with the service in the Pullman Buffet Car. In spite of the drizzle all the participants seemed to enjoy their time with us. The VCT managed to work in between the charter to cut and burn north of the Holloway Road foot crossing. Alan cut a lone figure as he tended to the railings on the river bridges at Jebbs Lane and Idridgehay until rained off. 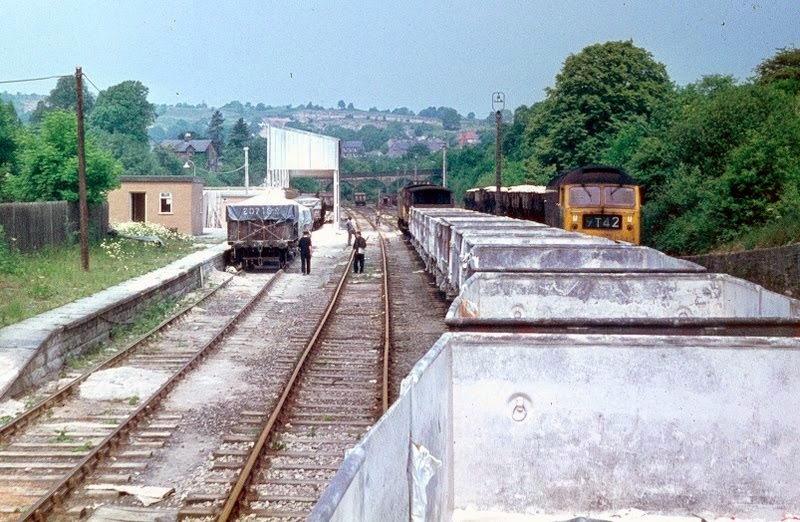 The PWT concentrated on the platform extension at Wirksworth whilst Mick tidied up the coal pile on the dust dock and the "Derbyshire gold" on Wash Green Dock as part of the preparations for next week's Classic Bus Rally where we will need every inch of car parking space. Much planning and ordering of material was accomplished to enable the footbridge repairs to be conducted in an expeditious way although not fast enough for Mrs Angry of Duffield. The Third Open received more sanding down of its paintwork and the dmu team most helpfully shunted stock into the correct positions for the weekend. Jumpers were greased to allow for trouble free multiple working and electrical problems on the Class 119 were tended to. The Filing Fairy chased down more paperwork to good effect and the Booking Hall had a most satisfactory day with charter and sundry other receipts. The M1M declared that the remaining roof leaks in the SK had been satisfactorily dealt with. PWT had yet another fair weather day today with 3 of the gang including our work experience chappy attending to a further 5 sleepers with the Land Rover whilst the rest of us continued with the framework for Wirksworth platform extension, the majority of which is now complete. Boarding for the surface arrives on the morrow. Carriage cleaner spent the day cleaning the maroon set ready for stabling until required for the L&Y loco visit in July/August. DMU team singular was busy painting the buffer beams on the 119 unit. Richard had the presence of mind last Saturday to notice a group comparing a set of photos at Ravenstor with what exists there today and being disorientated as, of course, nothing remains of the scenes from 1970. They responded to Richard's request for some scanned copies and the delightful results are shown below. Pleased I can provide a little history for you. Re 1970 visit, I have little info and a distant memory! We managed to arrange regular brake van trips with the railway society through good contacts in BR at both Derby and Leicester. 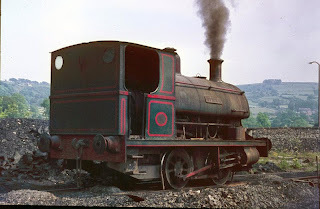 This would often entail adding an extra brake van for us and also included cab rides. Different times eh! I can remember trips to Corby/Northampton, down the GC to Ruddington and from Coalville. Wirksworth was special with steam as well and although I was on the June 1970 trip there was also a previous trip before I joined Loughborough. I've attached one last photo as it has a guy on the right who was obviously looking after us. (The middle 2 guys were on the trip yesterday.) Don't know if he was from Wirksworth quarry but someone may know him? Nothing like a little sunshine and warmth to raise the spirits and generate a feeling of wellbeing. However, a round up of yesterday's achievements deserves a mention first. Our locomotive hauled stock was shunted to Platform 2 to allow the CK to be completed with its lining out and the opportunity was taken to put a strengthening second coat on the first class designation yellow line. There was a training session with the BSK and SK on the intricacies of buck eye couplings for the guards so that they more easily understand the concept and what to look for to ensure the whole train is secure. The weed control team were able to make a whole line pass with the co-operation of the VCT with a much needed treatment. Weather conditions were ideal and hopefully we will see some positive results in a few days. The VCT were in action with the fencing north of Idridgehay. A surprise food hygiene inspection took place with much praise for the cleanliness of the Pullman Buffet Car. Much credit to Angela and her team for all the background work in the physical work to keep the place spotless and associated record keeping. On to today which saw the DST jacking Henry Ellison to release bearing that have been unexpectedly overheating. This is a long and tiring job that will continue at the weekend. A photo is shown of part of this activity. The dmu team conducted some essential shunting to permit today's services to run and then turned their attention to the drivers desk in the Class 119. There was also much modelling of uniform clothing that had appeared in the EVRA shop at bargain prices. The service was well supported and included visitors from the North Norfolk Railway and Chapel and Wakes Colne centre. There is a noticeable growth in passengers heading for Wirksworth and its Tuesday Market which has been the subject of much marketing effort. The LMSCA continued with various works on the Third Open which included glazing of the sliders, reducing the exterior to bare metal and progressing the refurbishment of the southern end gangway connection. The SBT reported a further 15 metres of top course being laid. The PWT continued to work their magic on the Wirksworth platform extension which is also illustrated. At Duffield both lawns were mowed and weeds treated with Fred & Iris cleansing the Mess Hall at Wirksworth once more. Today's train crew, Booking Halls and Pullman Buffet Car enjoyed a most successful day and I am most grateful for their energy which allows the coffers to be topped up. All in all, a most satisfactory day. other services contributed to the day's activities. sent him to Duffield with a supply of much needed toilet rolls. barbecued sausages left beyond Wolverhampton. The pullman buffet , model railway , narrow guage and booking offices were also kept busy. The crossing gates were kept open by Chris ,Eric and Tom which kept us on time and even the weeds were disposed of between trains. The lmca were kept busy sorting out the the sliders on the third open. A couple of cadets were kept busy painting the outside of the ladies toilet. The duty conscripts tackled painting the jcb weights , litter picking as well as the lawns. All in all another pleasing day many thanks to all who worked so hard on day one of the diesel weekend. PN - Safety is paramount on our railway , its your duty to keep yourselves and the visitors to railway esp when escorting them around the yard on running days. Use only only designated walking routes , wear high visability vests when on or around the track , respond to all warnings given by the locomotive crew. A pleasant, if slightly muggy day, with various experience guests having their experiences of the steam engine and the class 31. In the dim coolness of the shed the LMSCA Ice Cream Team set about clearing the gutters of the Third Open and removing a recalcitrant pin from the brake work by the application of heat. In the CK the south end lavatorial facilities received attention and the recently acquired SK had its roof issues inspected. There was also some surprise walking stick testing and a number of bridges were given a good looking at by the Civil Engineering Department. weeding, fan waving, phone answering, notice making, toilet cleaning and tiger hunting. Oh, I'm sorry, there was no tiger hunting. A day of numerous jobs to forward the enterprise. The VCT collected timber from Hazelwood and turned their attention to essential fence repairs north of Idridgehay where the materials on site were well beyond their sell by date. 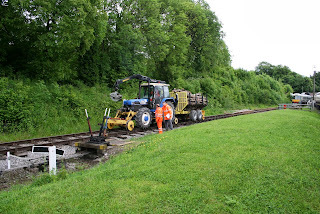 Mike Billings fitted the flail to the Komatsu and after a lot of fine tuning set off to tackle the vegetation around footpath and accommodation crossings to preserve the sight lines. This in addition to the Round Up received yesterday will help start reverse the take over of the line but an extreme spurt in weed growth over the last few weeks. 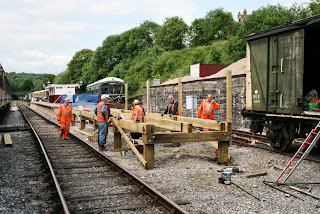 The PWT concentrated their efforts on the Wirksworth Platform 2 extension which will occupy them over the next few weeks. 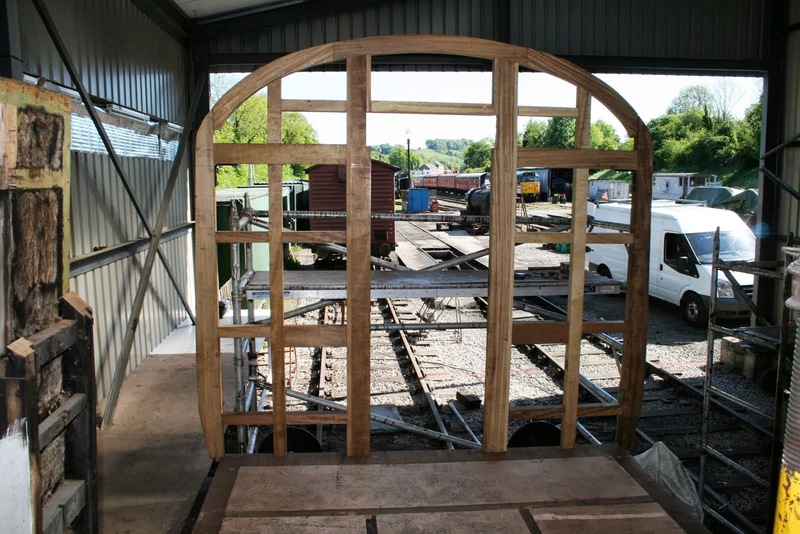 The Class 119 had interior timber fitted over the doors in the guards compartment and the team fuelled and filed the fleet ready for the upcoming weekend. A new water supply was created at the south end of Platform 1 which will aid the topping up of toilets without the hose trailing across the platform. The M1M continued with more improvements to the CK. The Pullman Buffet Car had a steady stream of visitors and staff. The Booking Hall turned its attention to school group opportunities and began to plan for rather special footplate experiences on the L&Y locomotive which will be marketed through our web site. Alan Johnson produced our first ever carriage roof boards which are illustrated in today's photos. Progress Wed 19th June 2013. Construction of Wirksworth platform extension has begun with all material dismantled on Monday removed from the work site and a third of the required leg supports built up and delivered to the work area. DMU team has been carrying out further works to the 119 unit under restoration which appears to be nearing completion. Buffet seemed to be busy all day with passing guests. Booking hall reports further charter bookings. Martin attended the funeral of Peter Taylor to represent the company and show our respect for a man that helped us a great deal. The first thing to report is a blatant case of trespass at Cemetery Lane Bridge, Wirksworth. The quick thinking Ollie narrowly averted a derailment as the offenders were captured. Photo attached. I can report they are now safe and well at the NFL sanctuary. 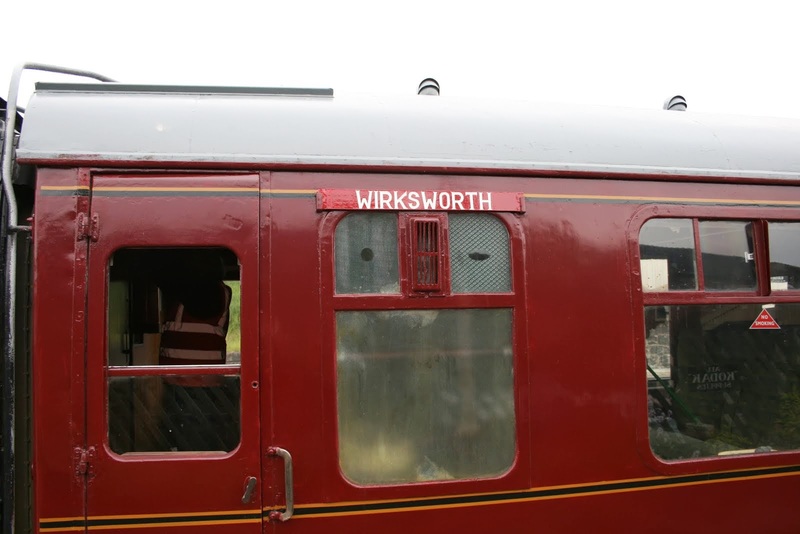 Meanwhile, the service was well supported and enjoyed the company of today's train crew, the Booking Halls at Wirksworth and Duffield, the EVRA shop and the Pullman Buffet Car. Special thanks to John and Owen who stepped in when we found there was no guard or third man volunteer for today's services. Something of a worry for the future. The DST readied Henry Ellison for its next driver experience day and tackled a number of tasks on Cathryn. The LMSCA commenced reglazing the sliders, as I found out these are the moving sections between the quarter lights. They achieved one out of the 20 to be refurbished. There was also work to the body of the Third Open and a start made to the damage south end corridor connection of the Third Open. The dmu team were most helpful in reorganising the stock for this weekend's diesel extravaganza allowing the LCC to cleanse the set prior to going on a short holiday. She was happy that work would be awaiting her on her return from unlimited enjoyment. They also solved an air leak on the Class 119 and painted the interior of some doors of the vehicle. The Passenger Department had one of their periodic briefing meetings and I attended a Network Rail meeting at Duffield that exposed their latest thoughts on a new footbridge for the Main Line station. Nothing is likely to happen until 2014 and we hope there may be some benefits for us in the general works there. The fact that it was warm and sunny for much of the day was reflected in a satisfactory financial trading result. Progress Mon 17th June 2013. All the timber for the extension of Wirksworth has been delivered today and P Way made a start on the project removing the fencing, gate and re setting the top copings to suit the new layout. All the timber has been moved to its respective place for construction to begin. We were hosts to 70 plus guests on our mid day charter with the buffet very busy serving all of them luncheon after which they had a trip up the incline to round off their visit. VCT were busy at FP 3 cutting out more overgrowth to open up the sight lines and managed 1 fire despite the interruption from train operations. Rodney carried on with more weeding and general tidying at Duffield. 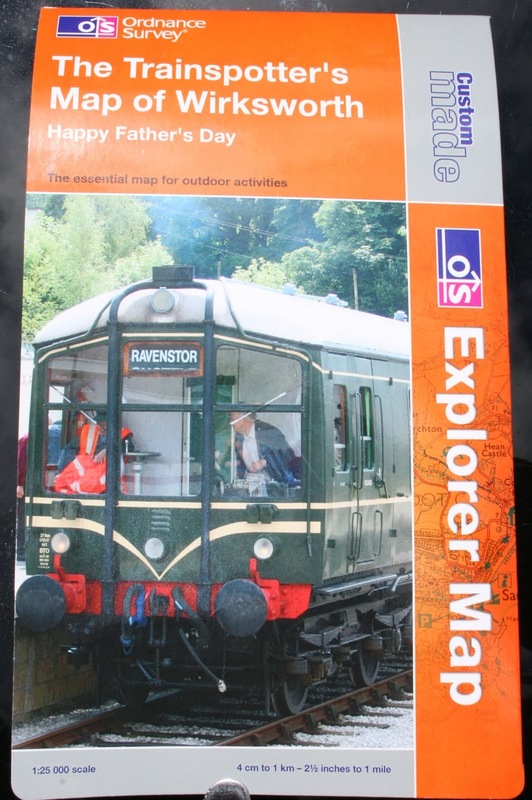 A very pleasant sunny day in which the passenger service pottered up and down and the buffet, having recovered from a circuit breaker moment, dealt with various father's day lunches. At Duffield, the Station Foreman attended to much tidying up and weeding work and engaged in some formation dancing, sorry, formation parking. transformation into an equally charming shade of green also continued. A couple of photos for you. 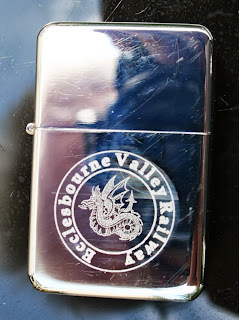 The first was an unexpected mailing received from the Ordnance Survey and the second a shot of the splendid new petrol lighter available from the Booking Hall at Wirksworth. It was great to welcome another test customer from Barnsley that immediately bonded with Mick who ensured our part in their day worked very well. Mick was accompanied by an old friend in the shape of Tom Birtwistle who has been reinvigorated for further PW work - we shall see! The VCT has dealt with further clearance in the area of Holloway Road and northwards to footpath F3. 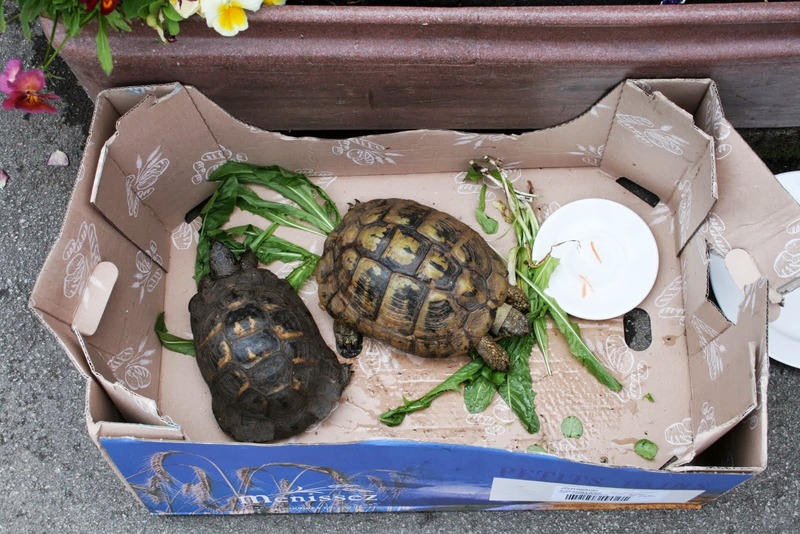 Their patience was tested by a neighbour who objected to their activity after depositing some years of garden waste onto our property. His protestations were not well received. The PWT carried on with the sleeper changing programme interrupted be heavy showers and today's test customer. The M1M worked on the CK with some ceiling painting and the next vehicle in line, the SK, curing a leaking ventilation cover and wrestling upholstery between compartments to ensure each one was co-ordinated. The vehicle will illustrate a number of seat covering that covers a time line of the tastes of the day. 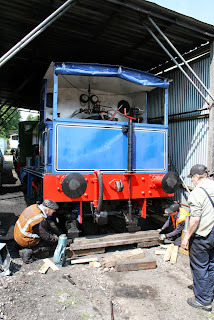 The dmu team continued to lift the Class 108 with minor repairs and fuelled Iris for the weekend. 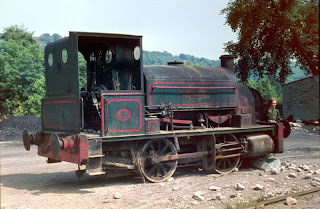 Allsop Enterprises and Mike Evans arranged the Class 119 to emerge into the fresh air so that it could dry off for varnishing. Unfortunately the heavens opening and the vehicle is tucked away again. The Booking Hall and Pullman Buffet Car looked after a number of visitors to good effect. 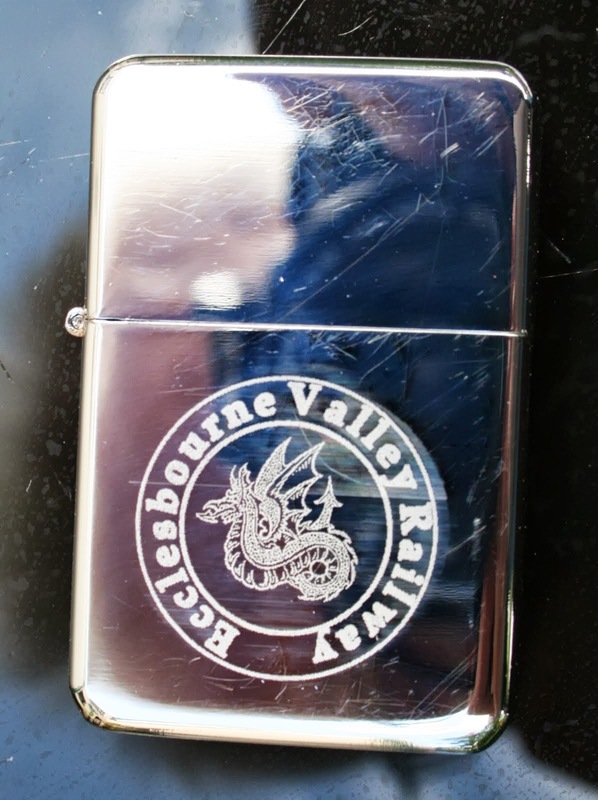 The Booking Hall has a new range of products including a splendid addition to smoking requisites, a Zippo lookilikey petrol lighter with the etched Ecclesbourne Valley Railway emblem. I have invested! A cockle warming day as we welcomed a return customer after 4 years absence. Their ensemble shows the way forward for the VCT with a very nice log carrier.The customer and vehicle acceptance body seemed content with activities on the Incline and within Wirksworth Yard which allowed the PWT a free run at their tasks. The PWT worked south to change a further six sleepers between Duffield and Hazelwood in less than ideal conditions. The rail saw received attention in the Wirksworth weighbridge workshop and two Johns achieved a thorough survey of fire extinguishers in advance of a formal annual survey on Friday. The Booking Hall and Pullman Buffet Car looked after a number of visitors tempted out by the warm, but dull, weather. A grey day as the weather conspired again to dampen the spirits. Our minimum cost service with the "Bubble Car" on the Duffield service and "Iris" running to Ravenstor ensured profitability with the limited number of visitors on offer. However, the train crew reported an encouraging number of through tickets that will bring benefits in the next accounting period. The Booking Halls at Duffield and Wirksworth looked after our guests and there was a pleasant flurry of group bookings for the future. The Pullman Buffet Car and EVRA shop did all possible to encourage spend. 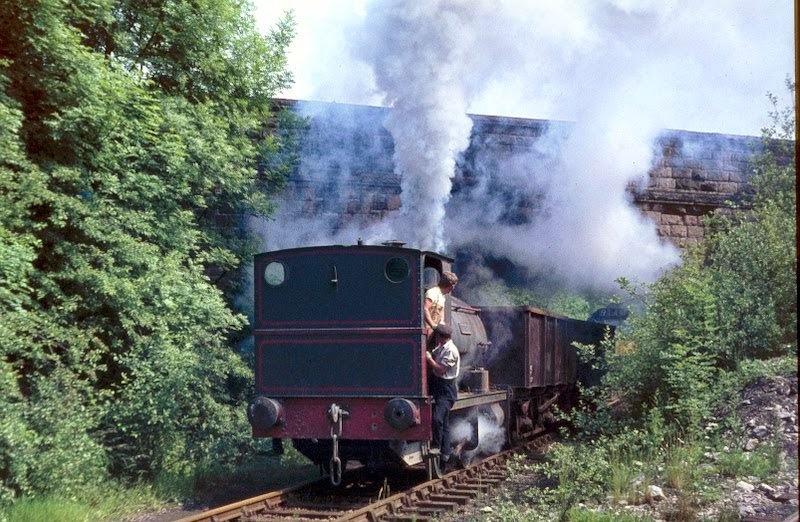 The DST had a planned visit from the boiler inspector who gave approval to their efforts to keep No3 in traffic for another year and prepared Henry Ellison for its next excursion on Friday. The LMSCA recovered more quarter lights from the Third Open for refurbishment and they attended to the watertightness, if that's a word, on the north corner of the vehicle. Some remedial welding was also undertaken. The dmu team received a set back on Sunday with the Class 108 but retrieved the situation today as they renewed the auto feed vacuum valve and accomplished a second change of the throttle controller. These changes, which I have to admit are a mystery to me, were achieved by a combination of older and younger members of the team. Fred and Iris gave their customary deep clean of the Mess Hall and the SBT dealt with some 25 metres of base course and 25 metres of walling in their quest to complete the rebuilding of the platform. Exploratory work commenced to see whether we can bypass the obstructions to the access to Shottle Station while being frustrated from the natural route by our neighbour. PS - Today's photo is of Peter in happier times as he participated in the opening of the Railway to Idridgehay kindly provided by Neil. His funeral will take place at Markeaton Crematorium next Wednesday, the 19th, at 1440hrs. A very sad day indeed to hear of the death of Peter Taylor, a railway man to the core whose enthusiasm for the Wirksworth branch knew no bounds.His unassuming manner and modesty belies the fact that his generosity was the financial cornerstone behind the opening of the railway to Idridgehay and again his confidence in Wyvern Rail along with EVRA to complete the task is another example of his belief that he, and we, were doing the right thing. In a world where greed, violence,lies and deception seem to be the order of the day it is indeed a pleasure to have known Peter Taylor and I am sure he would wish us to carry on regardless so here are todays doings. P Way managed 12 sleepers today and whilst the carpark was empty coal was transported to the loco shed with Komatsu. The Land rover has been recovered to Wirksworth for use with 1530 test customers later in the week. Rodney has been busy at Duffield painting and weeding. VCT attended Holloway road for some brash and weed clearance with further work at Idridgehay later in the day. The buffet was open but had a quiet day. The most modest of men. It is with tremendous sadness I report the death of Peter Taylor in the Macmillan Unit at Royal Derby Hospital in the early hours of this morning. 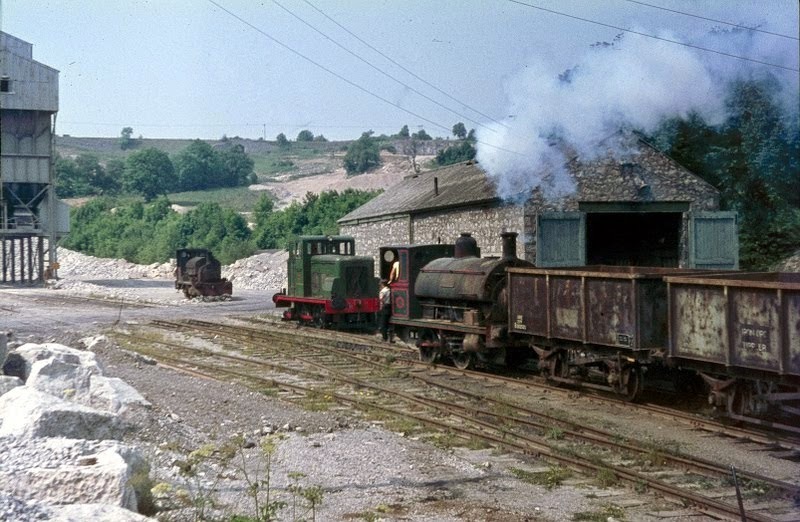 Peter really was our unsung hero who acknowledged a few years ago that he couldn't practically help with the renovation and restoration of our Railway but very unexpectedly said he wanted to see the line open to Idridgehay and would £100,000 do it? Undoubtedly we would not be running trains to Idridgehay let alone Duffield without his considerable help. 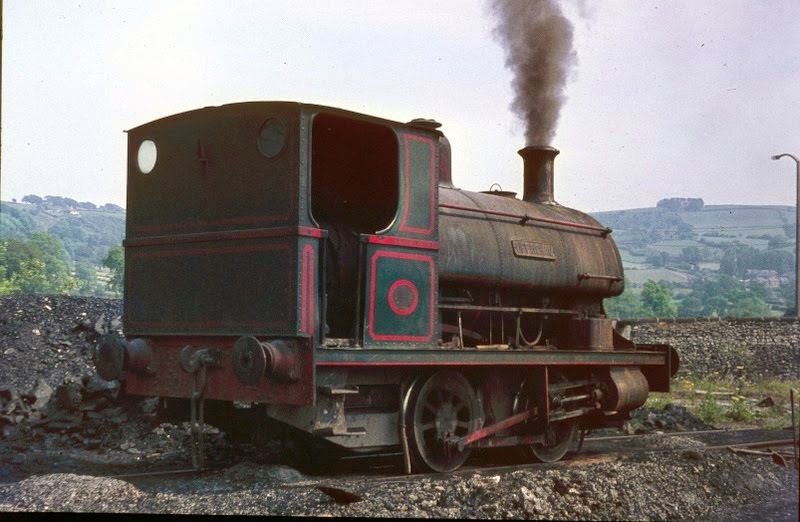 His last offer was to say "what would be the cost of a steam operation in the summer peak?" and when told this would be of the order of £25,000 breathed deeply and told me to get on with it. He ensured that before his last journey to hospital, declaring that "I am reaching the terminus", that the funds were in place to see this wish come to fruition. 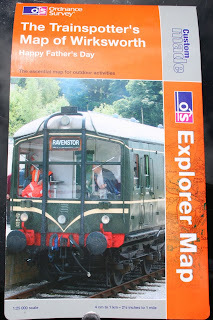 Our Railway owes so much to this one man who during his lifetime wanted no recognition. Peter was steeped in local railway traditions, held our line in deep affection and was its last Operations Manager before it was left to slumber. Our thoughts go out to Evelyn who did so much to support and comfort him over the last few years. The funeral arrangements I believe are on Wednesday 19th June at Markeaton Crematorium in the early afternoon but I will confirm when I have further and better particulars. A very lovely day here today, which encouraged people to potter around the station and watch our trains go by, as well as some of them getting on. Down the yard, the class 31 continued to receive the application of paint; the CK carriage had is vac tank repaired and now has exemplary braking; so too does railcar 50170 which had an air tank replacement this morning. In the shed the class 119 received its destination box glass, yet more paint in the parcels compartment and even more trim to the ceiling, at this rate there is going to be a national trim shortage. Finally, the class 108, little mentioned in these annals, fresh from having a new controller fitted the other day, was in such a state of shock at being run that it promptly blew a feed valve and is now in disgrace in platform 1 until Tuesday, when Fitter Green is going to give it a good seeing-to. Derbyshires friendly railway basked in sunshine as our steady stream of passengers and visitors enjoyed their day with high praise for the staff and food in the pullman buffet . The duty conscript was to be found brushing up on his painting as the station fencing had further coats of white paint applied. Grattion & Co decorating services where to be found busy in the 119 guards compartment. The lmsca completed the final for the end frame of the third open. The Duke had further work completed on the frame. The induction day was held in the training room with more vollunteers attending. Summer having come at last, we pottered around the station with today's Driver Experiences, both steam and diesel, and people sat around the station admiring our prowess. Meanwhile, down the yard, the class 31 received some scrutiny towards its forthcoming paint job: it will be turned out in green, someone's bound to ask; and the class 119 had work done on its trim, its guards compartment painting, its exterior lining and towards the replacement of its destination box glass. Change of day - for Wednesday read Thursday - the year rushes by. Lots of activity today with the dmu maintenance team out in force. The Class 108 was tested in its ability to communicate with other members of the fleet and undertook a few test runs on the Incline in the company of the "Bubble Car". Senior members of the team undertook a difficult job of dislodging an air tank from 50170 neatly located above the southern bogie and requiring loosening off of the brake rigging. The tank will be replaced by a spare after discovery of a pin hole leak. The PWT continued their replacement of sleepers and achieved another 6 in less than ideal conditions. The VCT turned their attention to the parapet railings on bridge DJW12 south of Idridgehay that had been damaged by a fallen tree. I omitted to mention that the EVRA shop has had an exterior makeover this week and it looks much more presentable. The M1M tackled the south end toilet of the CK with some success and Rod & Mary made inroads to the SK as compartment ceiling panels were taken down for refurbishment. 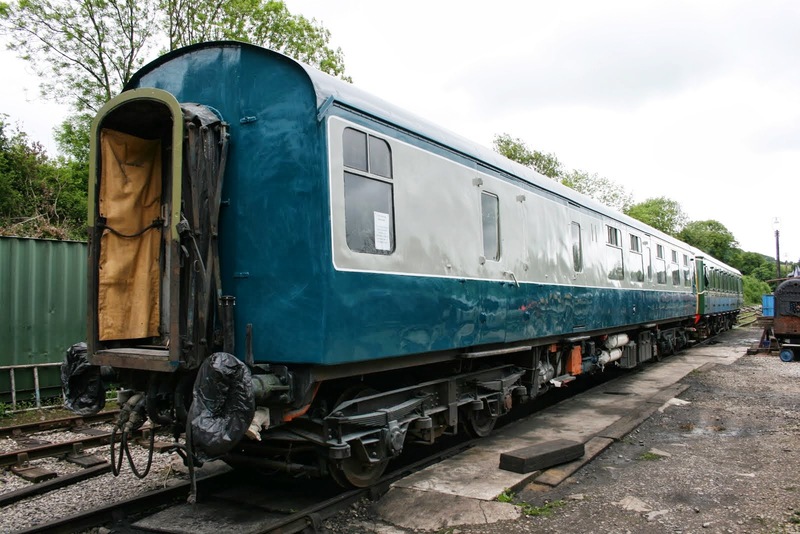 The Class 31 had some attention to its paintwork as preparations start to outshop in green. Today's photo shows John Allsop working his magic on the Class 119 which will illustrate our only vehicle in BR's blue and grey livery. The Pullman Buffet Car enjoyed a buoyant passing trade and the Booking Hall beavered away at advance bookings. After yesterday's volume of activity today was a little more steady. The PWT departed for Duffield to start the spot replacement of sleepers previously deposited in the areas to be attacked and dealt with 7 replacements. They also part loaded a wagon with logs. The work is quite protracted as there is some distance between each worksite. At base the LCC dealt with the two car set together with the Class 108 that had been brought into Platform 1 yesterday after a long period of inactivity. The Pullman Buffet Car looked after a few visitors but the Booking Hall was in fine form after taking two directly booked steam experiences. Another most active Tuesday with a notable test visitor from New South Wales. His Company has manufactured a piece of kit that was put through its paces to satisfy Network Rail that it could meet all the necessary braking tests and the result was successful making the trip halfway across the World worthwhile. My thanks go to John Evans who hosted today's test ending with a very satisfied customer. Not quite so long distance but worthy of recognition was an intrepid collector of magazines collated by Pat Craft who had travelled from Cornwall today but was delayed by cable theft in Somerset. 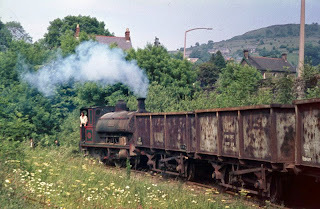 Pat then took the magazines on the 1420 Wirksworth to Duffield and made a hurried transfer to allow him to return south on the 1502 departure from the "main line" platform. Service indeed! 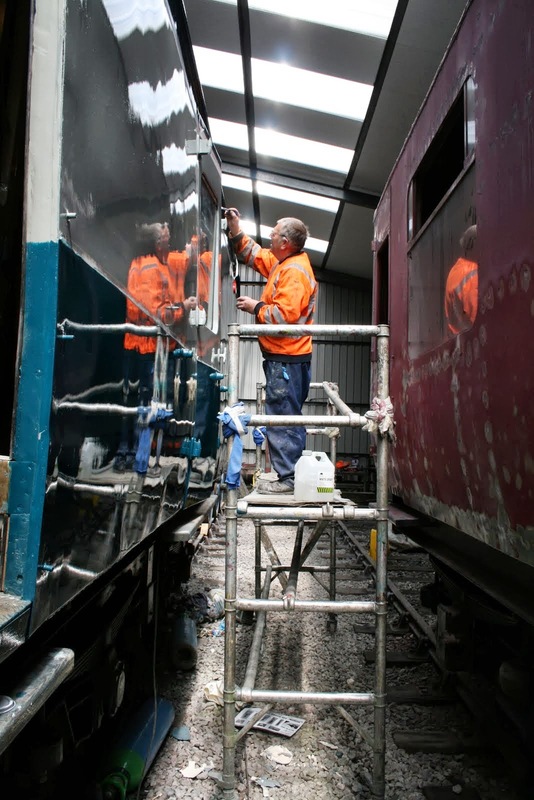 Allsop Enterprises was on the go all day with the east side of the Class 119 receiving its final gloss and the west side having attention to a couple of patches where the paint had adversely reacted to previously applied filler. The LMSCA were out in force, 10 of them, attending to a range of tasks on the BTO, the brake rigging on the TO and the reception of some amazing timber work to replace the fire damaged south end of the vehicle. The photo attached illustrated the work prepared by Lee Sharpe. The M1M completed the restoration of the north end toilet in the CK and progressed the long task of bringing their SK back to life. Fred, Iris and Dorothy had a group planting of our beds and tubs at Wirksworth which will result in another riot of colour for the delight of our visitors. The DST prepared Henry Ellison for its next experience day on Friday and accomplished further work on No3 to enable it to return to the operational fleet. Rob and Ollie made a series of informed decisions, after detective work, that resulted in the sidelined Class 108 returning to life. They detected water in the controller which was changed, a sticking relay that was unstuck and cleaned out the gutters to try and determine where the water was entering the cab. A great effort and a real contribution to our dmu fleet. Mick Kingsley mowed the embankments around Wirksworth station approach involving a great deal of physical effort given the gradients involved and operated the Komatsu to donate some coal from the "dust dock" to the bunker for Friday's activities. Essex Pete was without PW work and volunteered to paint the railings leading from the station buildings to the top of the "dust dock". A lone track patroller in the shape of Hylton managed to cover Shottle to Duffield and Shottle to Idridgehay with no alarms found. 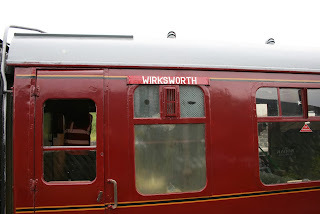 Lastly, but by no means least, the service was maintained to good effect as the sun tempted out a satisfactory number of passengers including, yet again, some Matlock bound people who found a journey to Wirksworth more acceptable. Supported by the Booking Halls at Wirksworth and Duffield together with the Pullman Buffet Car a good financial result was achieved. A wonderful warm sunny day here in the Gem of the Peak. The passenger service pottered along in its quietly efficient way and we had many very favourable comments about the railway and our helpful staff. Down the yard Oscars Painters slapped some mint around and the rebuilt LMS brake van had its ceiling painted white (this is a different LMS brake van from the one that was undercoated on the outside by Matt the other day). 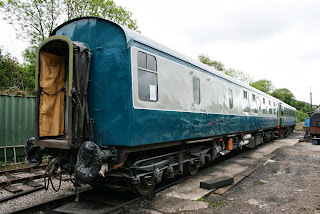 Meanwhile a rash of fitters were once again all over the class 119 and a lot of sanding was done in preparation for the interior paint job on its guards compartment. The class 31 received some attention to its exterior which will also no doubt be one of the next subjects for the application of paint. Up on the hillside, the guerilla gardeners strove to get on top of the weeds which have sprouted now the sun has come out.